An all-in-one breadmaker ideal for novice and experienced bread bakers alike, the Panasonic SD-RD250 makes horizontal loaves in medium and extra-large sizes. One nifty feature we appreciated was the nut and fruit dispenser, which adds the ingredients for you at the perfect time so they get mixed into the dough thoroughly. While this model doesn’t have very many preset baking modes, it nevertheless produces flavorful, textured bread with crispy crusts. Panasonic credits its lack of a viewing window for the more even heat distribution. 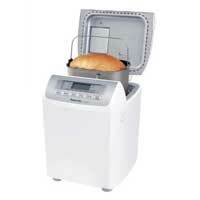 Overall, for $154.99, this breadmaker is a more than satisfactory addition to the kitchen.